SAN FRANCISCO, California, August 20, 2010 (ENS) – An attempt by irrigation districts to strip federal protected status from wild steelhead trout in California’s Central Valley was rejected in a ruling today from the Ninth Circuit Court of Appeals. This Endangered Species Act case is a challenge to the decision of the National Marine Fisheries Service to list the steelhead, a type of Pacific salmon, as a threatened species in California’s Central Valley. In listing the steelhead, NMFS defined it as a distinct species under the Act, separate from rainbow trout, another type of Pacific salmon that breeds with and looks like the steelhead. The separate listing was a departure from the prior NMFS policy of classifying interbreeding Pacific salmon as a single species. Six irrigation districts whose operations in the rich agricultural valley are impeded by the listing argued that the listing violated the Endangered Species Act because steelhead and rainbow trout interbreed, and the statute therefore requires NMFS to treat them as a single species. The irrigators filed this lawsuit in an attempt to win the right to withdraw more water from the Sacramento and San Joaquin River systems in the Central Valley. Five conservation and fishing groups intervened to support the government’s position – Northern California Council of the Federation of Fly Fishers, the Federation of Fly Fishers, Delta Fly Fishers, Trout Unlimited, and the Center for Biological Diversity. In its ruling today, the court agreed with the National Marine Fisheries Service and the conservation and fishing groups that the NMFS may protect steelhead without including all freshwater resident rainbow trout in the protected population. 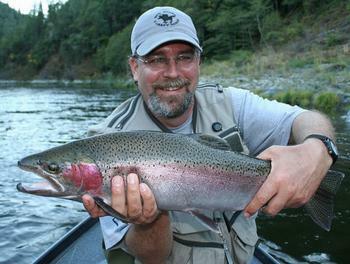 All parties agreed that the steelhead population is in decline in the Central Valley. Steelhead once returned from the ocean in the millions every year to the Sacramento and San Joaquin River systems in the Central Valley. Today, these fish have disappeared from 95 percent of their historic habitat, and they continue to face threats from unchecked water use, blockage by dams, urban sprawl, and polluted rivers, warn the conservation and fishing groups. The court’s ruling comes after a report issued earlier this month by the State Water Resources Control Board which found that greater flows and less water diversions were needed to restore the estuary and its imperiled fish populations. In its ruling, the court cited evidence from several independent scientific reviews that all found even where some interbreeding may occur, freshwater rainbow trout cannot regenerate or replace a steelhead population if those sea-run fish are lost.